LOS ANGELES, Jan. 10, 2018 /PRNewswire/ -- It was show time, as Eye Q Productions brought the Norwegian JOY, the first ship custom built to serve the high-end Chinese market, to life. Eye Q Productions, an award-winning creative production company in the Los Angeles area, transformed the Norwegian Cruise ship experience into an immersive evening for all of their guests. Eye Q Productions transformed the space into an interactive journey for all to experience. The full production team mapped the JOY cruise ship’s theatre with the latest projection technologies. For two weeks in 2017, the Eye Q Productions team worked alongside Norwegian’s entertainment production team and performers to produce a turnkey technical and creative projection design for two unique shows. 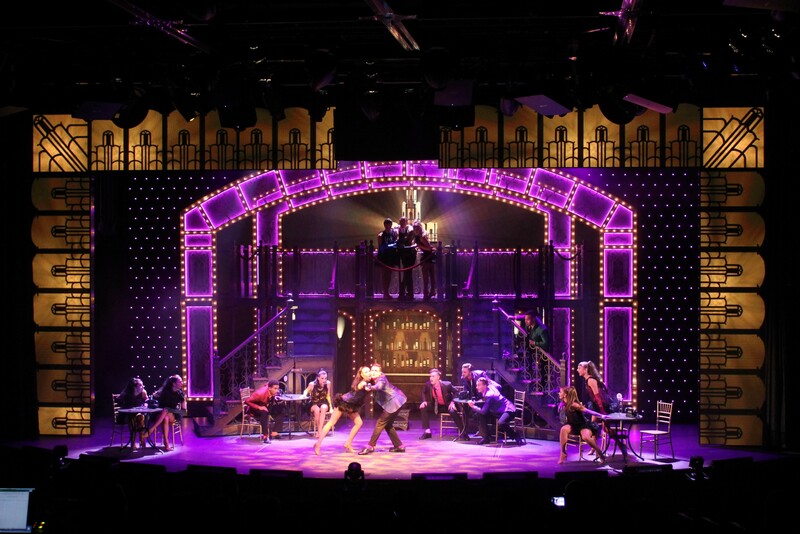 The two shows included Elements, a revue featuring illusions, choreography, and aerialists, and Paradis, which gave the experience of a Parisian speakeasy. For the Elements show, Eye Q Productions mapped out the house walls, stage deck, set, and even costumes, utilizing a large upstage LED wall and LED proscenium. This visually impressive show immersed the audience in each of the four seasons and elements. Earth was presented in each of the four seasons. Water introduced Muse, a gentle under-the-sea experience which brought audiences deeper into the mystery of the ocean. It then kicked up the fun and excitement factor, playing with water in all its forms, from bubbles and culminated in an intense storm at sea. Air lifted audiences up and blew them away – in a tornado experience. Meanwhile, Fire inspired, heated up and turned the theatre into a virtual fire ball. Snow, a beautifully performed ballet, ending with snow fall was the show's finale number. Paradis took a different approach, utilizing the immersive 3D projection mapping to invite audience members for an intimate peek into a secret Parisian night club. For the opening, Eye Q Productions created 5 square miles of the city in 3D animation, taking guests on an immersive journey through the streets of Paris, through the famous D’Orsay museum, to arrive at the entrance of a Parisian speak easy. Numbers included a beautiful silks aerialist act, for which Eye Q created a jaw dropping tracking video canopy, soaring underneath the Eiffel Tower that moves in perfect unison with the aerialists, a high energy dance number duplicating dancers into the house along with neon vfx and 3D paint splashes, and a number echoing the emotions of the performers onstage, magically transforming the scene from a pristine dressing room to peeling wallpaper to reveal a dark grungy industrial environment. The shows utilized a total of 15 video sources, edge-blended and mapped to create a fully immersive experience. #TeamEyeQ boarded JOY in Papenburg at the Meier Werf shipyard, during the time that the ship was still being built, to install the projection equipment and show control. The creative team joined in Eemshaven to start the programming process, followed by the cast, at which time rehearsals began for both shows. The team was onboard the Joy for a full month throughout sea trials and the handover ceremony in the Netherlands. The Eye Q Productions team took a few weeks off, and then returned, boarding in Guam. Here, the team put finishing touches on the show and built in the aerialist numbers, disembarking in Hong Kong, after readying the shows for the ship's inaugural cruise. The Eye Q Productions team onboard included Jenni Ogden, President & Executive Producer, Jeff Klein, Creative Director, Bill Lae and Sam Roseman. Content designers (animation and video) included Bill Lae, Sam Roseman, Sam Kriemelmeyer, Kelon Cen, Rob Buchanan, Michael Kory, and Stephen Robin. The technical team was led by Steve Gilbard, Technical Director and Sam Kriemelmeyer, Programmer. The Norwegian Cruise line has been voted best entertainment by Cruise Critic. The Norwegian team sought out Eye Q Productions to eclipse their current entertainment experience and turn it into an evening of visionary design. The Eye Q team applied 3D projection mapping and technical design, showcasing truly immersive entertainment to audiences worldwide. Since 2003, Eye Q Productions has created transformative projects, regardless of event size and staging. Eye Q Productions continues to produce visual narratives that take audiences on a journey. No ship experience compares to the roller coaster ride that Eye Q Productions constructed for the Norwegian Cruise audiences. Bring your imagination to life. Contact Eye Q Productions today for your next visual project. About Eye Q Productions: Eye Q Productions is a Los Angeles-based, award-winning creative production company. They have disrupted the space through cutting-edge technology, video design, projection mapping, virtual reality, augmented reality, animation, and more. Eye Q Productions continues to leave a visual impact in theater, 4D Dome experiences, architectural mapping, and TV development.